You demand the elegance of premium hardwood shutters, but want simple. accessible designs to complement your personal style. 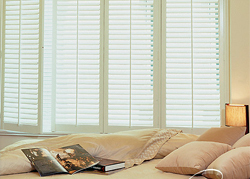 Normandy Shutters offer discerning homeowners the perfect solution. Handmade with premium hardwoods and finished in a popular array of soft neutral colors. Normandy Shutters will make a lasting impression in your home.